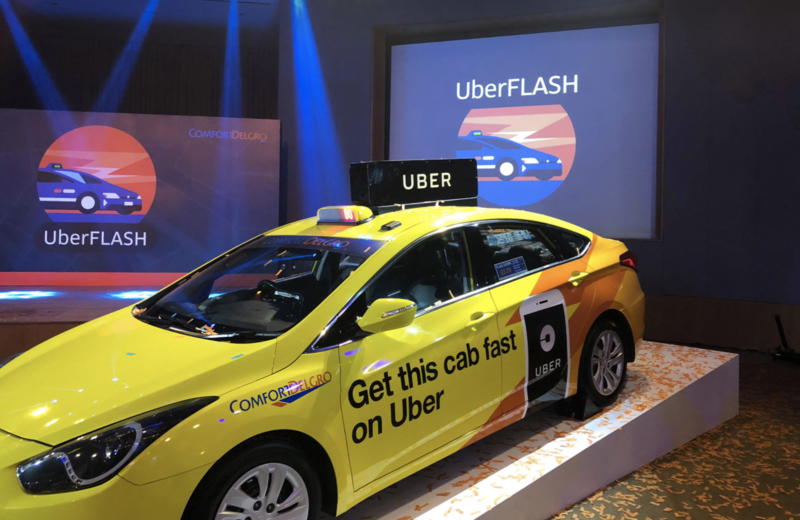 One month since the launch of UberFLASH in collaboration with ComfortDelGro, Uber has released a statement on the reception of its new product. Over 75% of Uber’s rider base choose UberFLASH as their preferred Uber product, resulting in 2.5x growth in UberFLASH trips since launch. Heartland penetration: Ridership on UberFLASH from heartland areas has grown over 30% since launch. Quality assured: 95% of ComfortDelGro drivers on UberFLASH are rated 4 and 5-stars by their riders. Average earnings have increased by 19% for ComfortDelGro drivers who are actively driving on UberFLASH. Increased efficiency: Drivers are spending less time idling and we see a 10% improvement where they are busy earning versus having an empty ride. Top ComfortDelGro driver has earned over $2,200 in take-home earnings per week on average through UberFLASH. Thousands of ComfortDelGro taxi drivers are reported to “have embraced UberFLASH” as they become more efficient with the increase in rider demand, and the higher earning potential. They cited Mr Sng, a ComfortDelGro cabbie for 13 years, as one example. He said requests had been “coming in back-to-back” on his first day driving on the Uber network. That day, he had scored 30 UberFLASH trips, twice his daily average. “[The] time I spent driving on the streets with an empty ride was reduced. I soon hit my target, and was able to call it a day earlier,” he told Uber. Private-hire driver-partners like Jonathan, who had been with Uber for eight months, are also enjoying the increase in rider demand. Uber, in partnership with ComfortDelGro, has just announced that starting from tomorrow (19th January 2018), it will be launching a new feature UberFLASH, which matches riders with the nearest ComfortDelGro taxi or an UberX driver. This reduces the waiting time and helps riders get to their destination much faster. “With UberFLASH, our commuters can get a vehicle nearest to him or her, be it a car or taxi from a large pool of tens of thousands of vehicles in one app,” said Mr Ang Wei Neng, CEO of ComfortDelGro Taxi. “Following the announcement of the strategic collaboration between our two companies just a month ago, I am delighted that we are moving quickly together in bringing to life our shared vision for the future of mobility,” shared Mr Brooks Entwistle, Uber’s Chief Business Officer for Asia Pacific. The strategic collaboration of course, refers to ComfortDelGro’s 51% stake acquisition in the Uber-owned rental car business, Lion City Holdings, which is valued at $642 million. With UberFLASH, riders will be able to see the trip fares upfront before requesting a ride. Uber also claims that the fares of UberFLASH rides will be 5 to 10% lower than an uberX. The fares on UberFLASH are also subjected to dynamic pricing, which means that it will fluctuate according to user demand. UberFLASH is also the first in a series of collaborative efforts between ComfortDelGro and Uber, according to ComfortDelGro’s Chief Executive Mr Ang Wei Neng. While UberFLASH might be good news to most loyal Uber riders, its arch-rival GRAB has long introduced a similar feature. UberFLASH draws similarity with GRAB’s JustGrab feature, which connects GRAB riders with the nearest taxis and GrabCar – JustGrab is also cheaper than a GrabCar ride. While Uber is in bed with ComfortDelGro, GRAB’s JustGrab feature has all five of Grab’s taxi partners – SMRT, Transcab, Premier, Prime, and HDT – as part of their service. To celebrate the launch of UberFLASH, it is offering promo codes for riders to try out the new service. If you are new to Uber, you can use the code “RIDEFLASH” to get $5 off 3 UberFLASH trips between 19 January and 10th February. If you are an existing Uber user, you can use the code “FLASHRIDER” to get $3 off 10 UberFLASH trips between 19th January and 10th February.